»Let's Explore The Offbeat Mount Abu In Rajasthan! Let's Explore The Offbeat Mount Abu In Rajasthan! The Shimla of Rajasthan, Mount Abu is the only hill station in the state. Therefore, it is one of the most-visited places in Rajasthan today. Tourists from all over the country come to this beautiful settlement to savour its natural surroundings. It is probably the only place in the state which houses historical monuments, ancient temples, beautiful lakes, wildlife sanctuaries and lush green hills. So, who wouldn't love to explore it? How about taking a road less travelled this time? Yes, we are talking about the offbeat Mount Abu. Over a period of time, it's popular places such as Nakki Lake and Dilwara Temples have been overexplored by tourists. Therefore, the time has come when we frequent its unspoken beauties. Following is the list of the best offbeat places one must visit while in and around Mount Abu. Like its name, Peace Park is an ultimate place within the main town of Mount Abu where you can actually feel the essence of peace and tranquillity. It is located within the campus of Brahma Kumaris World Spirituality University and makes for an ideal location to meditate and introspect. If you are looking forward to a place in Mount Abu where you can just laze by green lawns and enjoy the beauty of a divine garden, then you must head towards Peace Park. This beautiful park is all set to calm your mind, body and soul and send you to a composed world. The presence of colourful flowers and beautiful trees adds to its charm and loveliness. If you would love to take a stroll through ancient aisles of an age-old monument, then you can visit the ruins of Achalgarh Fort. The fort is located on the outskirts of Mount Abu and has a history dating back to the Paramara dynasty. As per records, it was built around the 10th century. However, later on, it was renovated in the mid 15th century by Rana Kumbha of the Mewar kingdom. Today, the fort is known for its beautiful Achaleshwar Mahadev Temple, which is an important religious site amongst Hindus and is dedicated to Lord Shiva. Hundreds of locals and Hindu devotees come here every year. If you love discovering new places and savouring unknown spots, then Achalgarh Fort is your stoppage. Located in the close proximity of the dazzling Nakki Lake, Shri Raghunath Ji Temple is one of the most beautiful temples in the town. It is dedicated to Lord Raghunath, an incarnation of Lord Vishnu, and was built in the 14th century. However, the exact year and dynasty behind its formation are still unknown. Over a period of time, the temple has become a highly revered pilgrimage site amongst Hindus, especially Vaishnavites. It is a strong belief that whoever visits this temple with utmost devotion gets rid of all problems in his life. The temple is also known for its beautiful wall paintings and intricate designs, and hence it attracts several architecture enthusiasts too. This is one of the few places in Mount Abu which are known to a very few offbeat travellers. 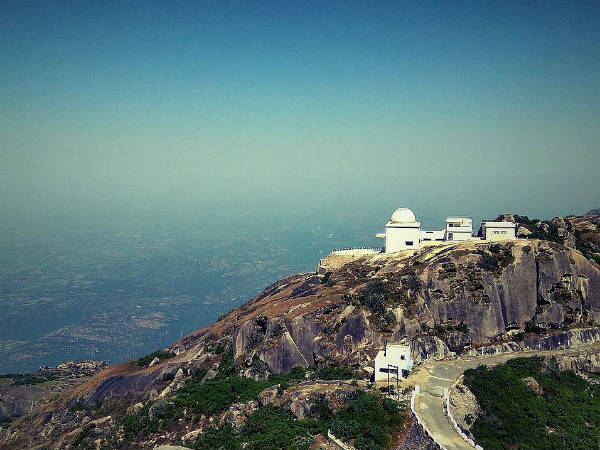 Located at an elevation of about 4000 ft, Honeymoon Point is a perfect place to enjoy the panoramic beauty of Mount Abu. It is here where you can do the best of nature photography. With the charming Nakki Lake in the background, it makes for a relaxing weekend getaway. If you would love to take a break from the bustling environment of Mount Abu and spend a few hours away from the town, then this wondrous viewpoint is an idyllic spot for you. Do not forget to bring your camera if you are looking forward to capturing the captivating beauty of nature. The temple can be reached by climbing a flight of about 365 stairs, Adhar Devi Temple overlooks the beautiful settlement and lush greenery of Mount Abu and is located inside a small cave. The temple is dedicated to Goddess Durga and is one of the least-explored places in the town. As it is only visited by locals and a few seasonal tourists, you can enjoy a serene and peaceful environment here. The major festival celebrated here is Navratri.